Former astronaut Jerry Ross prepares to sign his bobblehead for a young fan. Former NASA astronaut Jerry Ross is a seven-time space shuttle mission veteran and nine times walked into the void of space. The U.S. Air Force and NASA have recognized him dozens of times for his excellence and contributions to human spaceflight. Ross earned an honorary doctorate from Purdue University and he even has an elementary school named after him in his hometown of Crown Point, Ind. 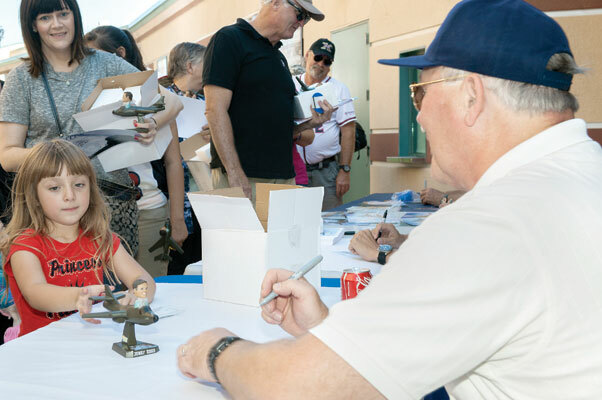 Now Ross has a bobble head figure in his likeness as well, thanks to the Lancaster JetHawk’s baseball team and its sponsors that honored him at the Aerospace Appreciation Night Aug. 9. The JetHawks are a Single A Advanced California League team. Ross is familiar with the community where the JetHawks play, as he graduated from the U.S. Air Force Test Pilot School at Edwards Air Force Base, Calif. While on active military duty at Edwards, Ross had key engineering and management roles in the B-1 Lancer program. As an astronaut, he landed four times at Edwards from space missions. He also was at NASA Armstrong Flight Research Center (then Dryden) at Edwards for the 1977 approach and landing tests of the Space Shuttle Enterprise prototype that was air launched from the back of a specially modified NASA 747 Shuttle Carrier Aircraft. Ross was welcomed to NASA Armstrong and the Air Force Test Center earlier in the day. At Armstrong, he was introduced to the center’s latest projects and programs. With seven missions to space, he can’t pick one as his favorite, but he did acknowledge that the earlier flights provided more time to look out the window. 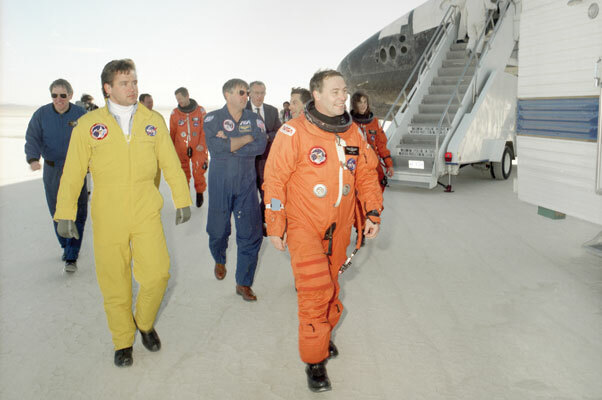 Former astronaut Jerry Ross landed at Edwards Air Force Base, Calif., four times, including the landing of Space Shuttle Atlantis at the conclusion of STS-37. Later flights were even more packed with work and allowed less time to look out the window as assembly of the International Space Station began as well as missions aboard the Russian Mir Space Station. 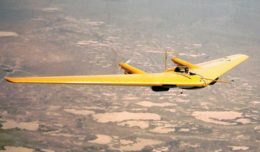 His first taste of aeronautics was when he joined his family to fly on an airplane during a family vacation and viewed Chicago from up above. Even so, he saw aviation as a means to an end. When he was in first grade, the first satellites were launched. Even though he liked Flash Gordon, he wasn’t a huge science fiction fan. But the more he learned about the space program, the more he wanted to get involved. He was fascinated and during the time he was in fourth grade, the United States decide to begin a space program. “When I went to Purdue, it was not to be an astronaut,” Ross explained. “No human beings had yet flown in space. I became an engineer and then I thought Test Pilot School was a good way to enhance my credentials. The path led to his acceptance for astronaut training and the extraordinary career that followed. He loved the challenging missions where space walks were necessary. On his first mission aboard Space Shuttle Atlantis he was concerned when the shuttle made it to orbit that something would happen to keep him from beginning his first spacewalk. “I wanted to do a spacewalk so bad I could barely stand it,” Ross recalled. “When I exited the space shuttle hatch I wanted to let out a warhoop of happiness, but I was afraid my crew inside and all of the people on the ground might think I had finally lost it and tell me get back inside. So I didn’t do it. Much planning went into the preparation and successful completion of spacewalks, he said, and all of the details were thoroughly worked out on the ground. That included 10 hours in a huge water tank at Johnson Space Center that simulates working in a space suit in zero gravity using full-scale mock ups of mission hardware. “The only time I was a little uncertain going out the door on a spacewalk was the one time I went out on an unplanned spacewalk during my third space shuttle flight,” Ross explained. “We were carrying the Compton Gamma Ray Observatory into space to deploy it. It was a sister observatory to Hubble Space Telescope. “We had picked the Compton Gamma Ray Observatory up with the robotic arm on the space shuttle and were holding it above the payload bay of the shuttle and had not yet released it. Ground controllers in Maryland had remotely deployed the two solar arrays, but when they attempted to deploy the antenna boom for the high gain antenna, a critical link that was going to downlink all of the data to the ground, it did not deploy. Ross had a role in the Space Shuttle Program from its inception to its conclusion, but he also had roles in the development of the International Space Station. To a young person thinking of becoming an astronaut, Ross suggests take every job you have and do the best with it. Take new opportunities as they present themselves and be available and have the right training to take advantage of chances when they come. Get a solid education, be a team player and the kind of person supervisors are pleased to nominate for new and exciting opportunities.